I have seen the Scheme example given on Wikipedia, but unfortunately it did not help. I believe in shorter explanations, so see the below image. Here we have two functions, f1() and f2(). f2() is inner to f1(). f1() has a variable, var x = 10. When invoking the function f1(), f2() can access the value of var x = 10. A closure is a function having access to the parent scope, even after the parent function has closed. So basically a closure is a function of another function. We can say like a child function. A closure is an inner function that has access to the outer (enclosing) function’s variables—scope chain. 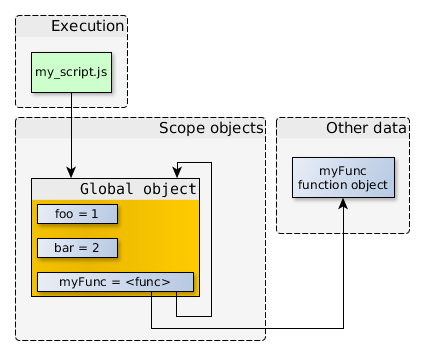 The closure has three scope chains: it has access to its own scope (variables defined between its curly brackets), it has access to the outer function’s variables, and it has access to the global variables. The inner function has access not only to the outer function’s variables but also to the outer function’s parameters. Note that the inner function cannot call the outer function’s arguments object, however, even though it can call the outer function’s parameters directly. You create a closure by adding a function inside another function. Closures are useful because they let you associate some data (the lexical environment) with a function that operates on that data. This has obvious parallels to object oriented programming, where objects allow us to associate some data (the object's properties) with one or more methods. "Really? Another Jamie? In Ann Ville? In your new country!!?" Here is a simple real-time scenario. Just read it through, and you will understand how we have used closure here (see how seat number is changing). All other examples explained previously are also very good to understand the concept. The inner function has access not only to the outer function’s variables, but also to the outer function’s parameters. Note that the inner function cannot call the outer function’s arguments object, however, even though it can call the outer function’s parameters directly. What would you expect this code to do? Tell me in a comment before you run it. I'm curious! Now open the console in your browser (Ctrl + Shift + I or F12, hopefully) and paste the code in and hit Enter. I put it this way because, once I understood that this code is putting instances of foo()'s inner function in bar and baz and then calling them via those variables, nothing else surprised me. But if I'm wrong and the console output surprised you, let me know! Everytime the function person is called a new closure is created. While variables a and b have the same introduce function, it is linked to different closures. And that closure will still exist even after the function person finishes execution. Assuming you know how a class in another language work, I will make an analogy. A new object containing all local variables will be created. Methods of this object have access to "properties" of that instance object. action: in order to achieve something for later execution. Daddy: Listen. Could you bring mum some milk (2). Daddy: Take a look at the map that Daddy has just made: mum is there and daddy is here. Daddy: Then off you go (3). Ok? Tom: A piece of cake! Example: Bring some milk to mum (=action). First get ready and bring the map (=init). To a developer I'd make a parallel between closures and OOP. The init phase is similar to passing arguments to a constructor in a traditional OO language; the action phase is ultimately the method you call to achieve what you want. And the method has access these init arguments using a mechanism called closure. A closure is the local variables for a function - kept alive after the function has returned. Closures are functions that refer to independent (free) variables. In other words, the function defined in the closure 'remembers' the environment in which it was created in. Closures are an extension of the concept of scope. 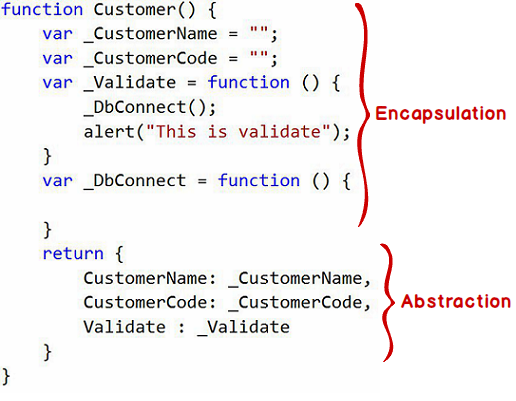 With closures, functions have access to variables that were available in the scope where the function was created. 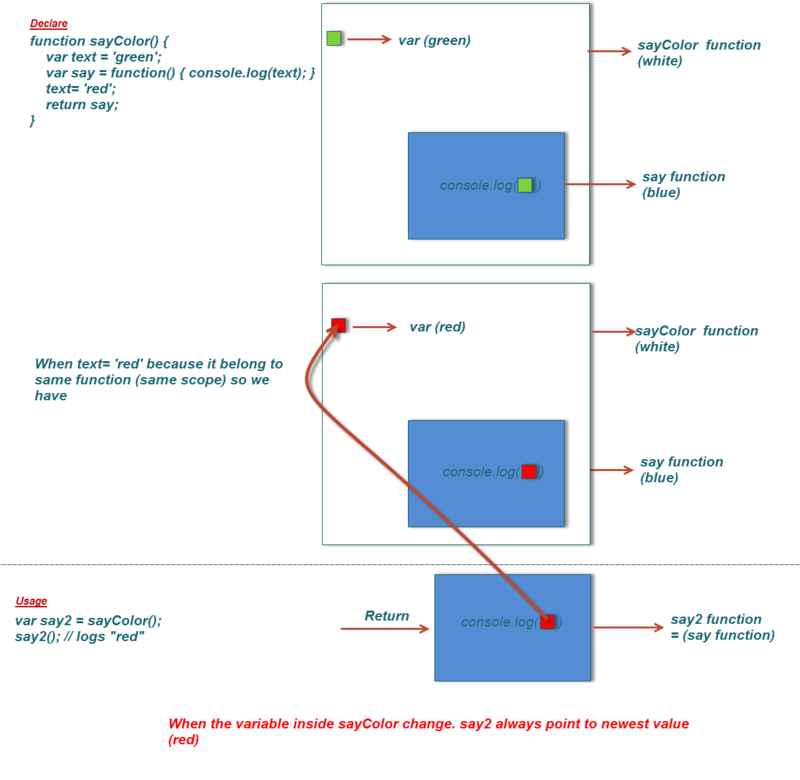 Closures are an abstraction mechanism that allow you to separate concerns very cleanly. Closures are useful in hiding the implementation of functionality while still revealing the interface. Closures are used extensively in jQuery and Node.js. While object literals are certainly easy to create and convenient for storing data, closures are often a better choice for creating static singleton namespaces in a large web application. Assuming my 6-year-old friend get to know addition very recently in his primary school, I felt this example of adding the two numbers would be the simplest and apt for the six-year-old to learn the closure. Example 1: Closure is achieved here by returning a function. Example 2: Closure is achieved here by returning an object literal. Thanks to the above links which helps me to understand and explain closure better. 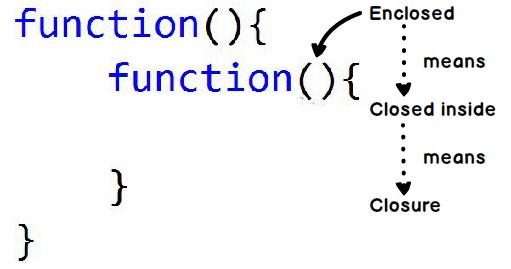 A closure is a function within a function that has access to its "parent" function's variables and parameters. 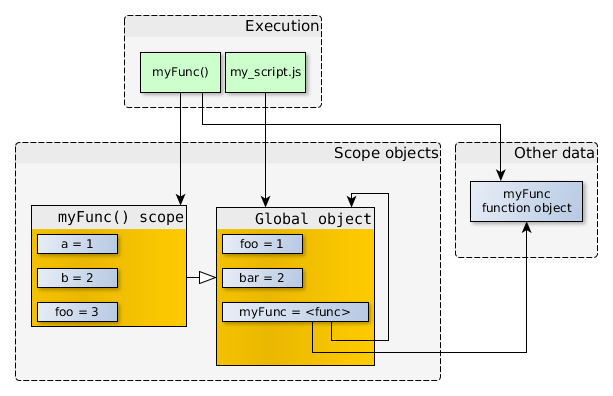 Understanding of how scope objects are created, used and deleted is a key to having a big picture and to understand how do closures work under the hood. See the aforementioned article for all the details. In this example, in first go, variable a is defined and then f is defined in the compilation phase. All undeclared variables are saved in the global scope. In the execution phase f is called with an argument. f's scope is assigned and the compilation and execution phase is repeated for it. 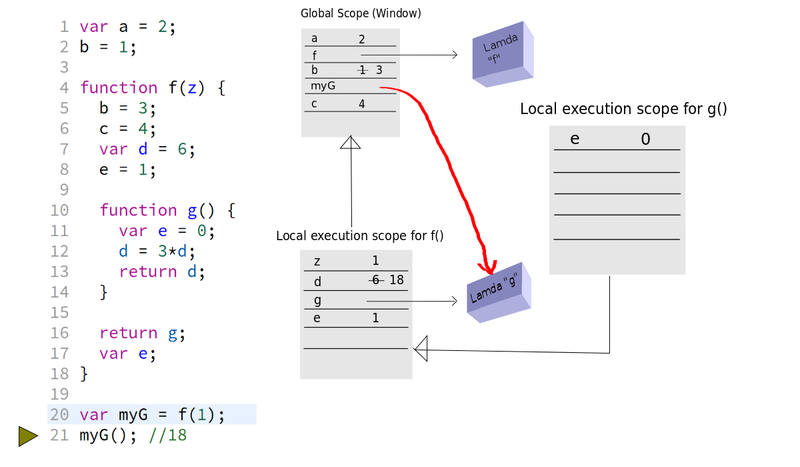 Arguments are also saved in this local scope for f. Whenever a local execution context or scope is created it contain a reference pointer to its parent scope. All variable access follows this lexical scope chain to find its value. If a variable is not found in the local scope it follows the chain and find it in its parent scope. This is also why a local variable overrides variables in the parent scope. The parent scope is called the "Closure" for local a scope or function. SO WHAT IS A CLOSURE? A function definition's (lambda) hidden [[scope]] reference. Holds the scope chain (preventing garbage collection). It is used and copied as the "outer environment reference" anytime the function is run. console.log(data); // Prints "My Data!" You see, sayName doesn't have the definition for the name variable, but it does use the value of name that was defined outside of sayName (in a parent scope). sayName will be called from inside functionThatTakesACallback (assume that, since I haven't implemented functionThatTakesACallback in this example). When sayName is called, it will log the value of the name variable. functionThatTakesACallback doesn't define a name variable (well, it could, but it wouldn't matter, so assume it doesn't). So we have sayName being called inside functionThatTakesACallback and referring to a name variable that is not defined inside functionThatTakesACallback. What happens then? A ReferenceError: name is not defined? No! The value of name is captured inside a closure. You can think of this closure as context associated to a function, that holds the values that were available where that function was defined. So: Even though name is not in scope where the function sayName will be called (inside functionThatTakesACallback), sayName can access the value for name that is captured in the closure associated with sayName. A good mental model is to think of function values as containing both the code in their body and the environment in which they are created. When called, the function body sees its original environment, not the environment in which the call is made. Closures are nothing but Stateful functions which maintain states of their private variables. Normally when you make a call to a function as shown in the below figure. The variables are created on a stack ( running RAM memory) used and then disallocated. So the closure code for the counter function above looks something as shown below.Its a function inside function with a return statement. So now if you make a call the counter will increment in other words the function call maintains states. But now the biggest question whats the use of such stateful function. 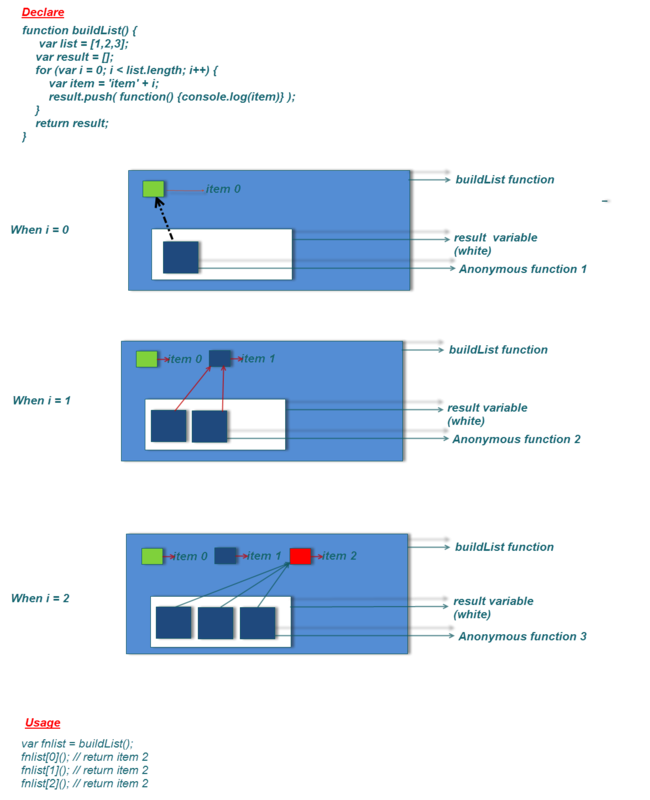 Stateful functions are building blocks to implement OOP concept like abstraction ,encapsulation and creating self contained modules. So whatever you want encapsulated you can put it as private and things to be exposed to public should be put in return statement. Also these components are self contained isolated objects so they do not pollute global variables. At its simplest definition (as other answers have pointed out), a closure is basically a function defined inside another function. And that inner function has access to variables defined in the scope of the outer function. The most common practice that you'll see using closures is defining variables and functions in the global scope, and having access to those variables in the function scope of that function. alert(x); //1, as opposed to undefined. You don't really have to be aware of closures to use them. But as others have also pointed out, they can be leveraged to create faux private variables. Until you get to needing private variables, just use them like you always have. In the above code, variable a and function b are available from anywhere in the code (that is, globally). Variable c is only available within the b function scope (that is, local). Most software developers won't be happy with this lack of scope flexibility, especially in large programs. Here, function a returns a function called b. Since b is defined within a, it automatically has access to whatever is defined in a, that is, x in this example. This is why b can return x + y without declaring x.
will assign the value 3 + 4 to d, that is 7. Remark: If someone modifies the value of x (say x = 22) after the instance of function b has been created, this will be reflected in b too. Hence a later call to c(4) would return 22 + 4, that is 26. The above is a closure where the function has no name, no argument and is called immediately. The highlighted code, which declares a global variable f, limits the scopes of f to the closure. The argument/variable tmp holds a local copy of the changing value of i when creating function instances. 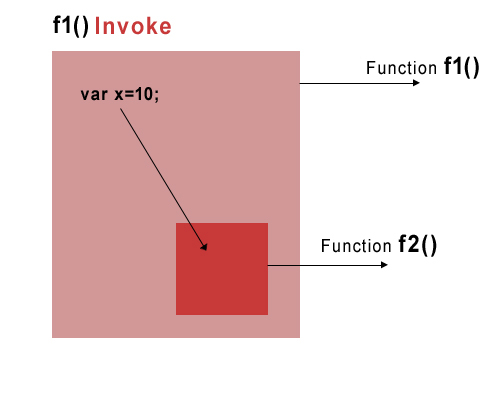 When a function is invoked, a new object is created to hold the local variables for that invocation. A function's scope depends on its declaration location, not its execution location. Now, assume an inner function declared within an outer function and referring to variables of that outer function. Further assume the outer function returns the inner function, as a function. Now there is an external reference to whatever values were in the inner function's scope (which, by our assumptions, includes values from the outer function). Anyway, for babies, closure is simply a hug, I guess, whatever way you try to explain :) And when you hug a friend of yours then you both kind of share anything you guys have at the moment. It's a rite of passage, once you've hugged somebody you're showing her trust and willingness to let her do with you a lot of things you don't allow and would hide from others. It's an act of friendship :). If you want to explain it to a six-year old child then you must find something very much simpler and NO code. Just tell the child that he is "open", which says that he is able to have relations with some others, his friends. At some point in time, he has determined friends (we can know the names of his friends), that is a closure. If you take a picture of him and his friends then he is "closed" relatively to his friendship ability. But in general, he is "open". During his whole life he will have many different sets of friends. One of these sets is a closure. If you understand it well you can explain it simple. And the simplest way is abstracting it from the context. Code aside, even programming aside. A metaphor example will do it better. Let's imagine that a function is a room whose walls are of glass, but they are special glass, like the ones in an interrogation room. From outside they are opaque, from inside they are transparent. It can be rooms inside other rooms, and the only way of contact is a phone. If you call from the outside, you don't know what is in it, but you know that the people inside will do a task if you give them certain information. They can see outside, so they can ask you for stuff that are outside and make changes to that stuff, but you can't change what it is inside from the outside, you don't even see (know) what it is inside. The people inside that room you are calling see what it is outside, but not what it is inside the rooms in that room, so they interact with them the way you are doing from outside. The people inside the most inner rooms can see many things, but the people of the most outer room don't even know about the most inner rooms' existence. For each call to an inner room, the people in that room keeps a record of the information about that specific call, and they are so good doing that that they never mistake one call stuff with other call stuff. Rooms are functions, visibility is scope, people doing task is statements, stuff are objects, phone calls are function calls, phone call information is arguments, call records are scope instances, the most outer room is the global object. Naturally each baseball game has the exact same rules and each game has its own score board. Naturally, the scores of one baseball game are completely separate from the other games. A closure is the special way Mr.Coder keeps the scoring of all his magical baseball games separate. The variable add is assigned the return value of a self-invoking function. The self-invoking function only runs once. It sets the counter to zero (0), and returns a function expression. This way add becomes a function. The "wonderful" part is that it can access the counter in the parent scope. The counter is protected by the scope of the anonymous function, and can only be changed using the add function. // it refers to Pinocchio and the mouth of the beast. A function is executed in the scope of the object/function in which it is defined. 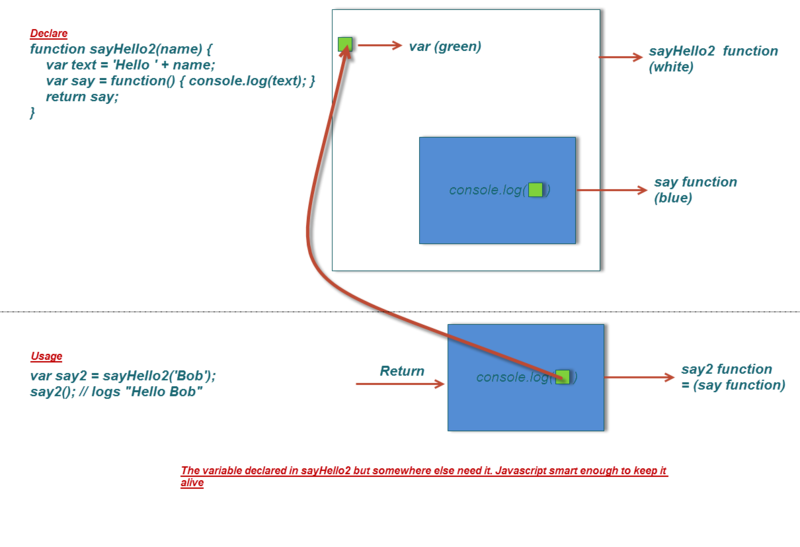 The said function can access the variables defined in the object/function where it has been defined while it is executing. Closures are a means through which inner functions can refer to the variables present in their outer enclosing function after their parent functions have already terminated. // A function that generates a new function for adding numbers. // adds five to it, and returns the resulting number. // when passed an argument of 4.
it can refer to variables from the context in which it was created (that is, it is closed with respect to variable access, in the mathematical sense of the word "closed"). Closures are a mainstay of functional languages, but they are present in many other languages as well (for example, Java's anonymous inner classes). You can do cool stuff with them: they allow deferred execution and some elegant tricks of style. And read the result from the calculate.number variable, who needs "return" anyway. What is the purpose of passing arguments to anonymous functions in this manner?